AVID Jazz here presents three classic Dave Brubeck albums plus, including original LP liner notes on a finely re-mastered and low priced double CD. 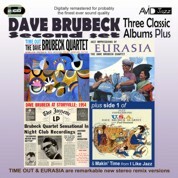 Time Outl, Jazz Impressions Of Eurasia, and Dave Brubeck At Storyville: 1954 plus an extra bonus LP side from Jazz Impressions Of The U.S.A. What can we say about the classic Brubeck album Time Out and its most famous track Take Five that has not been said before?! Only that in our humble opinion this is the best re-mastered version you will ever hear and is now the only version you will ever need to own! Our other classic albums find DB travelling across Europe and Asia for Jazz Impressions of Eurasia where he channels his experiences into tracks like Marble Arch, Brandenburg Gate and the eastern inspired Calcutta Blues. As a contrast to his live college recordings our next offering finds DB live At Storyville:1954 where we can clearly hear the contrast between a rousing DB in a college setting and a more laid back DB in a night club mood! We conclude with the first side of Jazz Impressions of the USA written from notebook scribblings while the band were touring across the USA. All three albums plus, have been digitally re-mastered for probably the finest sound quality ever!